Trecenydd Community Centre is a Community Centre located in Caerphilly. It is run by a management committee, comprised of volunteers. Trecenydd Community Centre provides activities for local residents in the Trecenydd, Glenfields and Hendredenny areas. Regular events include Lunch Club, Bingo, Tae Kwon-Do classes, Kickboxing classes and Bowls. The Community Centre is available to hire for children’s birthday parties, wedding parties and business meetings. The premises is licenced, so a bar can be provided at your party too. We look forward to seeing you at Trecenydd Community Centre soon! 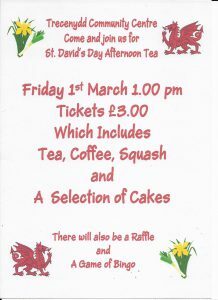 Tickets are £3.00 which includes a drink and a selection of cakes. We also have a choir. Tickets are now on sale for our Pantomime ( Sleeping Beauty ) on Sunday 2nd December. afternoon or Sunday evening or contact a Committee member. 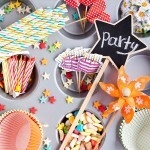 Trecenydd Community Centre is available to hire for children’s birthday parties. Please check availability by contacting our Booking Secretary on 07852 683976 or call to Trecenydd Community Centre, Second Avenue, Trecenydd, Caerphilly CF83 2SN on a Wednesday between 1:00pm – 3:00pm.